Two-wheeler driving in India, in the last two decades, can be summed up by saying "From 'No Problem' bike to 'No Tension' bike." If the Suzuki Samurai was touted as the 'no problem bike,' which made every average Indian want to possess one, the TVS Jive would also makes its way into the Indian hearts and household, with no clutch and the tag of the 'no tension' bike. The TVS Jive is an 110cc commuter's bike that aims to let the user ride at slow speeds even at a high gear, without being stalled, a feature that will make it a formidable choice for the legendary Indian roads. As has already been mentioned, the clutch-less wonder named TVS Jive is meant for commuters. This four stoke, single cylinder, air cooled and 110cc delivers a maximum power of 8.4Bhp at the speed of 7500rpm and a maximum torque of 8.3Nm at 5500rpm. The absence of clutch does seem on the outset as if the manufacturers have bent their backs too much to accommodate even the first time bike rider, and people might also think that this bike would spoil a potential bike rider by making him incapable of riding a bike that does come with 'the gargantuan task' of applying the clutch, but it will, in fact, bring about the change in people, making them use the right gear for the right speed. The engine is semi-automatic, which is also an attraction for people who have been using bikes with manual transmission. 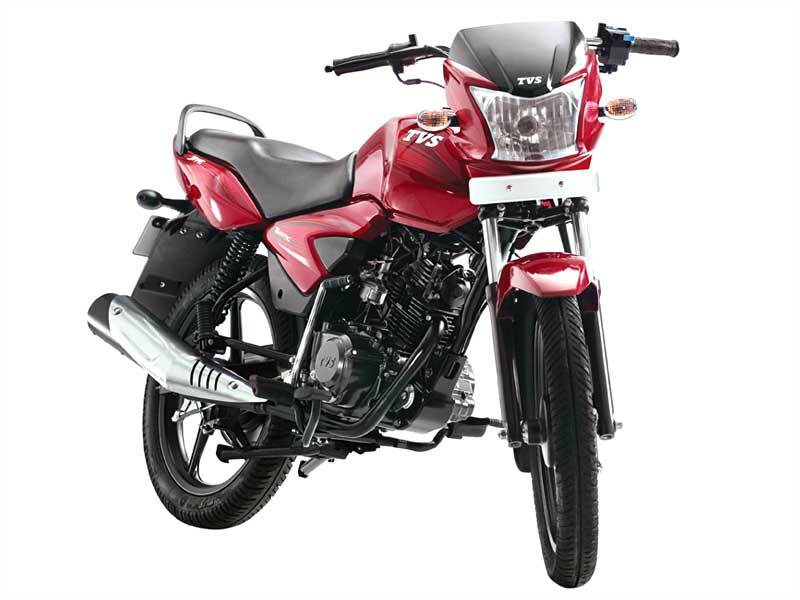 Even where its design is concerned, the TVS Jive makes its preferences clear - it looks simple, yet sporty and aims to attract the first timer, most of whom look for the slim, sporty look. What's more, it doesn't just offer comfort to the menfolk who ride it, but also aims to prove itself comfortable for the womenfolk who ride pillion, by doing away with the step-up seat. Every other aspect of it - headlights, tail lights, indicators - speak of a utilitarian and practical design. 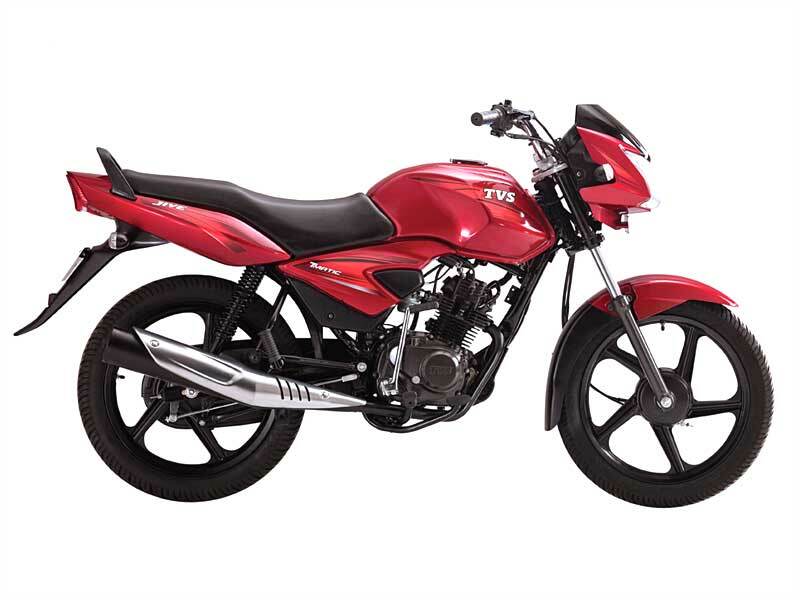 Its alloy wheels bear five spokes, further adding to its 'common man's bike' charm.The TVS Jive is smooth in ride, notwithstanding the many aspersions casted on semi-automatic transmission. A bike that can be started or stopped at any gear and allows the rider to ride at a speed of 10-20km/h in the fourth gear, making it an ideal choice for Indian roads and Indian traffic, this bike does deserve the 'No Tension' tag that it comes with. The TVS Jive is smooth in ride, notwithstanding the many aspersions casted on semi-automatic transmission. A bike that can be started or stopped at any gear and allows the rider to ride at a speed of 10-20km/h in the fourth gear, making it an ideal choice for Indian roads and Indian traffic, this bike does deserve the 'No Tension' tag that it comes with. As a clutchless bike from TVS group, TVS Jive boasts of a road mileage of 65-68 km/l.